Vendor: Corel Corporation Sold by: Amazon Web Services, Inc.
PDF Fusion™ combines easy PDF editing, drag and drop PDF creation and support for over 100 file formats. It's the essential all-in-one PDF solution. Take pages from multiple files, including documents, spreadsheets and presentations, and combine them into a single PDF to share with anyone. Add new text, bookmarks and comments. 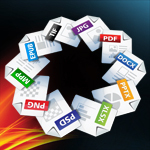 Plus, convert files to PDF, PDF/A, XPS and DOC formats with just a click. You will be charged $2.75 for each user assigned to the application.